The last time you read about PS 191 in the news it probably wasn't a happy story. Over the past year, the school has been at the center of a neighborhood in turmoil over rezoning and all the community angst that comes with it. But last Friday, as Principal Lauren Keville and a PS 191 pre-kindergartner cut the ribbon to the school's new pop-up library, there were only smiles as staff and families joined with parents from schools throughout District 3 to celebrate something beautiful they had built together. "Our parents have done a tremendous job," said Keville, praising not only swiftness of donations that poured in for the project, but also the months of manual labor and planning involved. "We have a place to engage with our kids about books and hold literacy workshops for parents. This really fits in with all the changes we're making in our school." 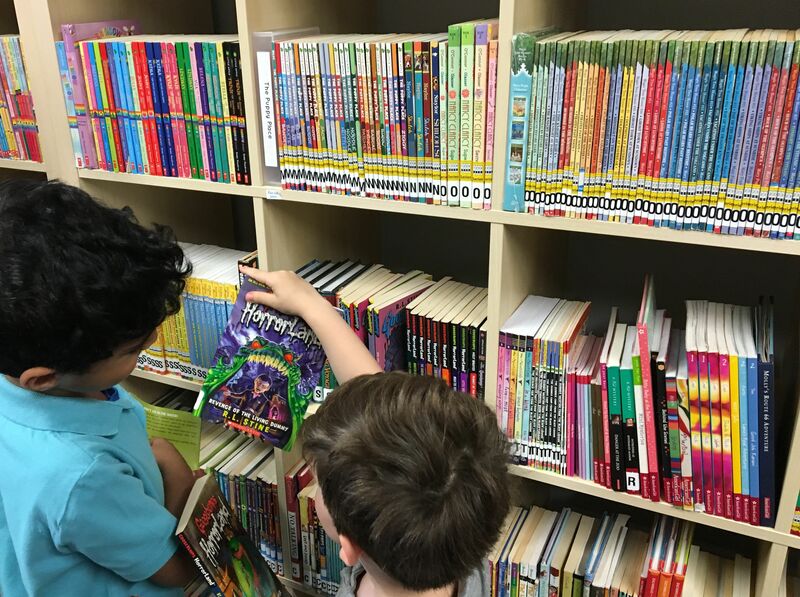 Several years ago the school's previous library was remade into a state-of-the-art media lab, and while families and staffers embraced this exciting new opportunity, the void left by the missing library was always felt. "Every other school in this neighborhood has a library," said PTA President Kajsa Reaves, "Why not us?" This spring, PS 191 won a $350K grant through Councilperson Helen Rosenthal's office to build a new library, but as pre-k parent Katie Miller noted, "Money can take time to arrive." In February, Miller and Reaves met with the PS 191 principal and floated ideas about how they could get a library up and running sooner for the kids. From there the idea took off. Within days, pre-k parents had found a site (two adjoining rooms on the first floor that were being used as a teacher lounge and parent room) and raised enough funds to buy basic supplies for the space. Parent Homera Zaman enlisted help from the Muslim Volunteers for New York to create an Amazon book drive with donations that came from as far away as Texas and Canada. Schools throughout the neighborhood, both public and private, held collection drives. Things were starting to come together. Once the books arrived, Zaman and a cohort of fellow PS 191 parents worked for about four months, five days a week all day sorting, labeling, scanning and shelving. Volunteers poured in from neighborhood schools PS 199, PS 87, PS 166 and PS 9 to help. Ann Strohmeir, former librarian at the Trinity School, joined the effort and gave advice. The Family School donated rugs. By May, Zaman and Miller had to start turning people down. The result is two bright and tidy rooms with with cozy seating areas, whimsical wall decals and more than 5,000 books. A small reading corner was set aside in special tribute to longtime teacher Sharon Pavlovich who passed away in 2015. "I've done a lot of charity work over the years," said Zaman, "and this is probably the best."